It's over for Omarion and Apryl Jones. The "I Ain't Even Done" singer announced Sunday that he is, in fact, done dating the Love & Hip Hop: Hollywood star. "This is the only public statement I will make about a private matter," he wrote on Instagram. "After this, I will not speak on or respond to any questions or comments on the matter. I thank everyone in advance for respecting my wishes to keep my family life private." 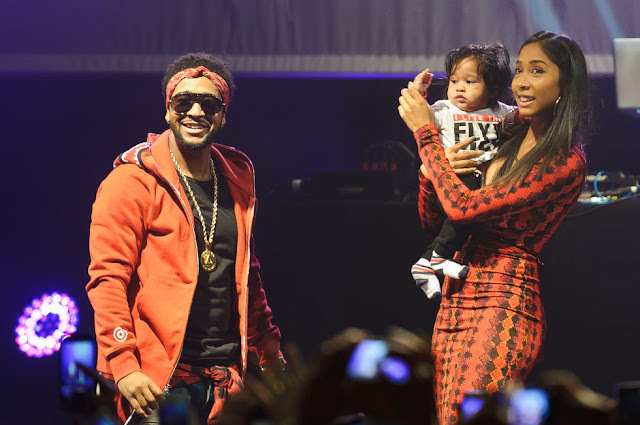 Omarion, 31, and Apryl, 29, are parents to son Megaa Omari, 23 months, and daughter A'mei Kazuko, 4 months. "The beautiful and talented mother of my children for whom I hold the highest regard and respect, Apryl Jones, and I have mutually decided to end our relationship," Omarion told his 2.5 million Instagram followers. "We continue to love and support one another and still share a common goal to remain friends while being great parents to our children." Jones confirmed the breakup, tweeting, "Single.... the end…." The cause of the couple's split is unknown. The breakup took some fans by surprise, given that just three weeks ago, Omarion wrote a heartfelt message praising Apryl's parenting. "She put put up with my Krazy," he wrote in an Instagram caption. "Now we have crazy kids. Thank you for giving me the two best gifts ever! A'mei & Megaa. They changed me forever! & Maybe I don't express my gratitude enough. I am rebuilding some things inside myself. With all that goes on in my world, I can depend on you. Because you're solid. Thank you @aprylsjones just in case you needed a reminder on how awesome of a mother you're. Looking at my time line I'am aware i could be dealing with someone way worst. Glad that's not our situation."